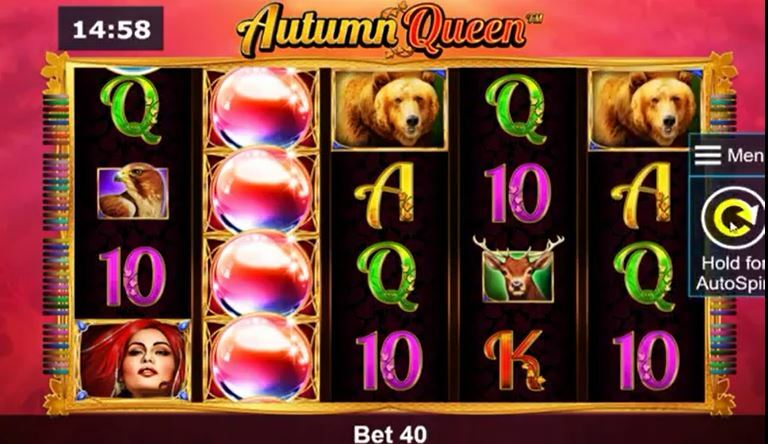 Autumn Queen slot is a 40-line game with 5 reels of 4 rows. The theme is centred around 'The Fall' in woodland and has a brown bear and other animals featured along with the usual card symbols of A, K and Q etc. It appears in mobile version so is playable on any device as well as desktops. Note the trotting sounds when the reels land, reminiscent of pretty much every Aristocrat slot ever made. The Autumn Queen herself is the top-paying symbol and as with all the others except the scatter appears singly - no stacks in the base game here. Non-multiplying Wilds appear on all reels as do the very distinctive silver-pink globes which will be needed for the bonus! There are no in-play random features. 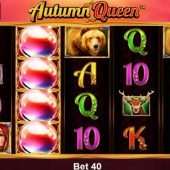 The bonus round on Autumn Queen slot is triggered in exactly the same way as WMS's Bierhaus Slot. You need 5 or more consecutive globe symbols starting on reels 1 and 2 to trigger 5 free games. Should you get more than 5, you will receive 5 more free games for each globe therefore if you stacked them up on all reels you would receive 80 free games, or 10 if you should get say 4 on reel 1 and one each on reels 2 and 3. During the free games super stacks of leaves appear on the reels and after the spin they will blow away to reveal the same symbol underneath. If you had all 5 reels overlaid with leaves with the best Autumn Queen symbol (which pays 12.5x stake for 5-of-a-kind) underneath you would thus gain 500x stake! Increasingly developers seem to be copying ideas from others in order to bang-out more games in seemingly a 'new' slot free-for-all. This game is simply a Novomatic take on WMS's Bierhaus as mentioned above but the RTP of 95.04% is nearly 1% lower than WMS's game, which is a popular one so we know Autumn Queen works but do we really need this game? I prefer lots of other Novomatic slots, such as the oceanic Dolphin's Pearl Deluxe or the old-fashioned Faust slot.